If you’re talking to someone and they suddenly pause, look confused and say, “I just lost my train of thought,” that doesn’t mean the person actually lost or missed a train! Instead, it means they forgot what they were talking about. People might use this idiom during a long conversation, when they forget the next thing they are going to say, or maybe when they are distracted by something else, like watching TV, while talking. When someone loses her train of thought, you simply wait for a few seconds to see if she remembers what she was saying, or you can both move on to a different topic of conversation. 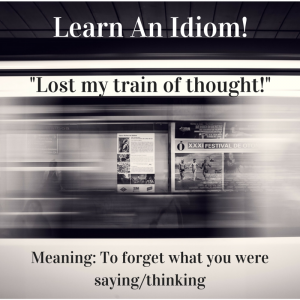 The next time you’re speaking to someone and you suddenly forget what you were going to say, try using the idiom, ”I lost my train of thought,” and you’ll sound like a natural English speaker! esl-blog american idiom, english phrase, english saying, figurative expression, learn an idiom, learn English, Learn slang. permalink.